The Citizen Potawatomi Nation Cultural Heritage Center reopened its doors more than 10 months ago, revealing a museum that is hardly recognizable to the one destroyed by an uncapped City of Shawnee water line in 2014. After years of construction, rehabilitation and painstakingly detailed work by Tribal employees and heritage center staff, the museum resumed full operations in January 2018. Today, it contains interactive displays and exhibitions informing visitors of Citizen Potawatomi origins, history and experiences. 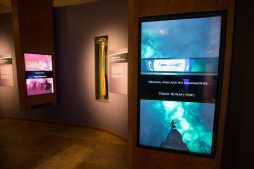 The gallery’s interactives utilize 21st century technology to preserve Potawatomi oral traditions. The Association of Tribal Archives, Libraries, & Museums recently recognized CHC staff’s efforts throughout the years. At the ATALM’s Guardian of Culture and Lifeways awards, the heritage center’s gallery titled Mamogosnan’s Gifts: Origins of the Potawatomi People became the organization’s 2018 Museum Institutional Excellence Award recipient. The Oklahoma Museum Association also gave the CHC two awards in its exhibits category for Mamogosnan’s Gifts impact and innovation. The CHC received the OMA Exhibit Award and the Technology Media Award for its interactive displays. “The long existence of the Nishnabe people has been preserved and passed on through story and song. Zheshmowen (language) reveals our origins, guides us in ceremony and unites us with our ancestors. Gifted from one generation to the next, our oral heritage is the foundation of our culture and traditions.